We are happy to see that you have found our website! Greetings and Joy at our meeting. 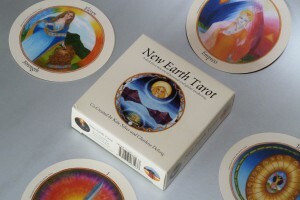 We are offering the New Earth Tarot for the new age in which we live. The New Earth Tarot has been designed as a map for personal and spiritual growth, an instruction manual for creation and manifestation, a possible therapeutic method, a tool of divination and a reference source for metaphysical knowledge…. and if that is more than you bargained for, it is also designed for you to have fun with. You’ll find the cards and book available to purchase in the store. And, look for The New Earth Tarot Handbook by Kathleen Silver to be published by the end of the year.